A dynamic guide to more than 100 books that will get kids talking and reading more. How do children become good readers? In Reading Together, educational consultant Diane W. Frankenstein shares the secret: guiding children to find an appropriate book and talking with them about the story helps them connect with what they read. 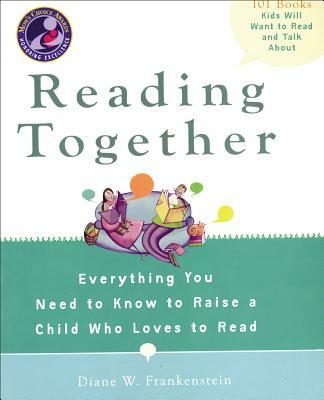 This engaging guide shares advice for parents, teachers, librarians, and caregivers on how to help children find what to read, and then through conversation, how to find meaning and pleasure in their reading. With more than 100 great book recommendations for kids from Pre-K through grade six, as well as related conversation starters, Reading Together offers a winning equation to turn children into lifelong readers. Some of the award-winning books discussed include Betty G. Birney?s World According to Humphrey, Gennifer Choldenko?s Notes from a Liar and Her Dog, and David Shannon?s Bad Case of Stripes. Diane W. Frankenstein has been an Educational Consultant in children’s and adolescent literature since 1989. In addition to her work with over 150 different school communities, she has consulted for organizations such as the American Association of University Women, California Association of Independent Schools, Girl Scouts of America, Young Presidents Organizations (YPO), YMCA, United Nations Association, Parenteen: Parents Coalition of Bay Area High Schools and others. Diane consults throughout the United States as well as in Asia and Europe. Since 1998 she has consulted in China, specifically Beijing and Hong Kong, where she conducted workshops for both the international and local school communities as well as for as with the Hong Kong Board of Education. Diane was born in Los Angeles, CA and attended High School in Milwaukee, WI. She is married and has two grown sons and lives in San Francisco CA. "The book has a cheerful, chatty tone--each selection contains a story synopsis, questions about the characters and a list of related titles--and yet there is also something poignant here. In beseeching parents to make conversation with their children, and reminding them to "be patient" and "try listening", the author hints at an impoverishment in American homes that has come, perhaps, with all those TV hours logged by Nielsen." "Education consultant Frankenstein believes that the right book in the right hands at the right time is only the first step on the journey to developing confident readers. Readers who can discuss the books they've read will go even further. Here, she presents an excellent system for achieving that goal. The bulk of the book is made up of 100-plus "Story Pages", which include both "Read Together" and "Read Alone" age ranges, story synopses, thematic keywordsk, sample discussion questions, and read-alikes. Teachers and librarians will go wild for this one. Be sure to have copies both for circulation and for reference." "This great guide offers tips on instilling a genuine interest in reading, plus book-based conversation starters for tots to tweens." "Wonderful! Diane Frankenstein's book is a priceless gift to parents, teachers, and anyone who cares about children. Filled with wisdom, humor, helpful ideas--and most of all, the pure joy and passion for books--this volume is an absolute treasure. It is a great resource for everyone who loves children and books." "Diane Frankenstein has written an exceptional practical guide to exploring and expanding on children's literature that will help anyone who reads with children to extend the experience and help them make connections between their thoughts and what they read. Also, by enriching young readers' current experiences, it can also encourage them to become lifelong readers drawn to the enduring power of the written word to help them understand and articulate thoughts about life as they experience it." "In Reading Together, Frankenstein's enthusiasm for igniting children's love of reading is infectious. Her strategies are practical and actionable, and her book recommendations are a wonderful resource." "In Reading Together, Diane Frankenstein provides a delightful springboard for conversations between adults and children about literature. The author distills a lifetime of reading and teaching children's literature into an accessible guidebook that will be useful in the library and the classroom and, most important, at home. Original and imaginitive, the book is a wonderful resource for parents and educators who are interested in generating--and sustaining--a love of reading in young people." "A must-have parenting tool! Diane's exceptional knowledge and experience in children's literature can finally be shared with the world. Parents and teachers from any culture will learn how to ignite a passion for reading in their children with this book. Offering over 100 quality book recommendations, complete with related questions, learn how to talk with children about books and the world we live in. Diane's reading tips and conversation starters can be used with an book, in any language!" "The subtitle of this book, 'Everything You Need to Know to Raise a Child Who Loves to Read', may sound audacious, but it's actually overly modest. Parents and educators who use this book will be raising children who love to learn. Diane Frankenstein teaches us that, through books, children learn language-oral and written-and through language, they learn to think. Importantly, she shows us that the most important outcome may not just be how many books children have read, but how many conversations they've had about them."